Over the past few days we’ve received two donations of plums from our English neighbours Pat and Tony, whose tree has been almost bending under the weight of the small cherry-like plums. And they are simply delicious. I’ve been eating them almost like sweets, but there’s a limit to how many plums one should eat at a time – and something tells me I’ve passed it! As I write, a few pots of plum jam are cooling in the kitchen and, when I’ve restocked with sugar, I’ll be making more, and also freezing some of the fruit for the future (The Boss is extremely partial to a plum crumble). 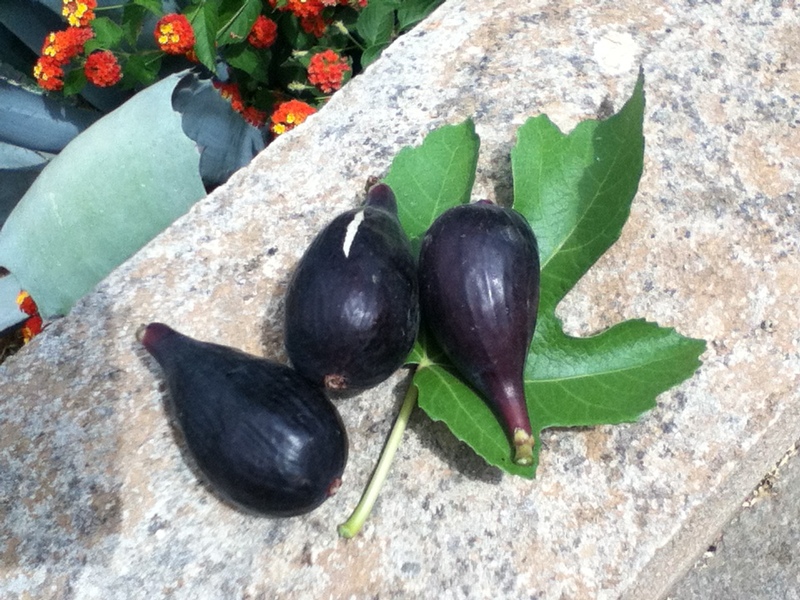 While at our neighbours’ house we noticed they had figs ripe and ready for picking, whereas our largest fig tree still has only the tiniest of hard green fruits – our harvest usually comes in September. But we do have some small and old fig trees elsewhere on our land – albeit not very accessible – and were prompted to check those out for progress of any fruit. To our surprise, we found a handful ready to eat, with more likely to be ripe before too long. Looks like I’ll be spending quite a bit more time in the kitchen this week . . .
← The world’s most expensive soup? That is fantastic! How I would love to have the climate for fig trees! But…..of course, I have to remember that along with that climate would come some pretty hot temperatures. We have had some high eighties temps here in the Rocky Mountains and we think it’s too hot. Fortunately, when the sun goes down the evening breeze takes over and one has to actually put on a light sweater or jacket. I bet plum jam is scrumptious! Yum!